Springs are the core of the suspension system. Various types of springs are used to absorb the bumps and keep your car at its proper trim height. These can be coil sprinqs, leaf springs, torsion bars, or air springs.Most cars use either coil or leaf springs; sport-utility vehicles use coil springs, torsion bars, or leaf springs. You’ll find computer-controlled air springs on select luxury cars, such as Chrysler New Yorkers, Lincoln Continentals, and some Cadillacs. Leaf springs are usually made up of several relatively thin metal plates, called leaves, piled one on top of the other. The reason for using these layers instead of one thick metal bar is that, as a bar bends, the top of the bar has to stretch a little. Unlike a single, thick bar, which, if bent too far, would split from the top down, leaf springs are more flexible each leaf bends independently, and the leaves can slide on one another instead of breaking. 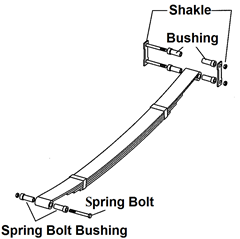 Each end of a set of leaf springs is attached to the frame at the rear of the car with fittings that allow the springs to bend and move freely. These fittings usually have rubber bushings that allow the fittings to bend and twist freely; they also absorb some of the vibration and pre­vent it from reaching the passenger compartment. Some vehicles, such as the Chevrolet Corvette, utilize fiber-composite (fiberglass) leaf springs. Coil springs look like old-fashioned bed springs. They’re usually found at the front of the car, although they can be at both the front and the rear. 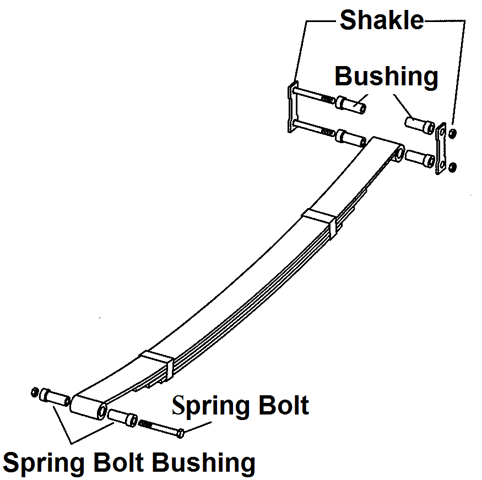 Coil springs are typically used with strut-type suspensions, too. At the front end, coil springs help cushion the bumps, vibrations, and steering movements. At the rear, they’re suspended between control arms that have rubber bushings. Torsion bars are used mainly in sport, utility vehicles and pre-1980 Chrysler products. They are located at the front of the vehicle, connected to the lower control arms. They twist to accommodate differences in the load that the car may be carrying, allowing the front wheels to move up and down freely. Think of torsion bars as coil springs that didn’t get wound into a spiral. Air springs are usually found on, luxury vehicles. A rubber air spring can be filled with the right amount of compressed air to control the ride and maintain the proper height. With this type of system, a computer moni­tors the ride height and signals an onboard air compressor to pump more air into the air springs whenever weight is added to the vehicle. When the weight is removed, the computer turns on an exhaust solenoid to let air out of the air. Usually, there’s nothing to lubricate with air springs. But check with the dealer to find out whether it’s okay to apply a rubber conditioner to the air bags to prevent them from wearing out prematurely.